This briefing focuses on non-Polish European insurers playing a critical role in supporting the coal industry and its expansion in Poland. Since 2013, they have signed at least 21 underwriting contracts, providing cover without which new projects could not be built and existing operations would have to shut down. 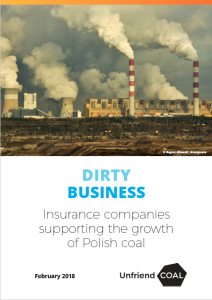 European insurers also finance the Polish coal industry through their local Polish pension funds, with over €1.3 billion invested in Polish coal companies.